“I have known John Lagerquist as an esteemed colleague and as a flute repairman for over 25 years. His expertise as a technician stems from a thorough knowledge of flute mechanics and is coupled with his status as a highly talented flutist and piccoloist with the Washington Opera Orchestra at the John F. Kennedy Center, Washington, D.C. The flute is now ready for padding. All of these steps are performed regardless of the type of pad used. 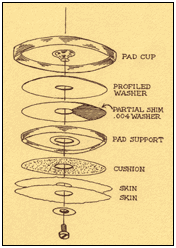 These steps are absolutely necessary when using Schmidt or Straubinger pads. Time: Averages twelve hours on flutes of recent manufacture. Older flutes often take much more. Piccolos usually take a little less time, but not in all cases. In some shops, buffing is a standard part of an overhaul, especially at the factory where they have a separate buffing department. At Lagerquist Flute Service, flutes are not buffed unless absolutely necessary, as in the case of dent or scratch removal or very severe tarnish. It is too easy to damage tone-holes at the buffer, and on older hand-made flutes that are already very thin, further metal removal is not recommended. This is the minor form of the overhaul. Time: Usually ranges from two to six hours. Two to three hours is typical. This should be done at least once a year, if you are using the flute constantly; COA should be done more often. Time: Clean, Oil, Adjust can often be done in an hour. Prices range from $800 for C foot flutes with closed holes and adjustment screws to $1,200 and up for French model flutes with B foot, including Schmidt pads. Price can vary considerably with the age and condition of the instrument. All other procedures are billed at the rate of $80 per hour. These include soldering, dent and scratch removal, bearing adjustment, key swedging, tone hole soldering and refacing, embouchure carving, lip plate or head tube replacement, straight to conical pivot conversion, make new steels, make new head stopper, upgrade antique head stopper, clean oil adjust, and others.